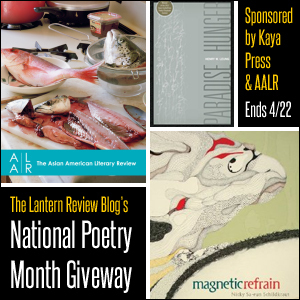 This week, we’re featuring the prompt submitted by the grand prize winner of our National Poetry Month Prompt Contest (sponsored by Kaya Press) . . .
We loved the freshness of Tamiko’s exercise, and the way that it challenges the writer to combine the particular vocabulary of one activity with the extremely close, almost manic, focus, of an “obsession.” As poets, we all have obsessions to which we find ourselves returning again and again, and Tamiko’s prompt provides a great way to step out of the boxes we draw for ourselves in order to approach a familiar topic from a new angle. First, make a list of your obsessions – the topics you find yourself writing or thinking about again and again. Now, think of a specific thing that you know how to do well – knitting, rock climbing, photoshop, fixing cars, etc. Make a list of as many words specific to that activity – the specialized vocabulary of it – that you can think of. Finally, choose one of your obsessions (not related to the activity you chose) and write a poem about it, incorporating as many words from the second list as you can. Tamiko will receive a copy of Lisa Chen’s Mouth, courtesy of the folks at Kaya Press. Congratulations, Tamiko, and thanks once again to all who submitted! This week, we’re featuring the prompt submitted by LR reader Aaron Geiger, whom we’ve chosen as the first runner-up in our National Poetry Month Prompt Contest (sponsored by Kaya Press). We really enjoyed the genre-bending nature of this exercise and thought it was a fun and unusual approach to the challenge of writing narrative poetry. Find one of your favorite short stories or essays; perhaps even one you might have written. Make sure it is a story that you know, or that you are going to read thoroughly. Deconstruct the elements of the story into a form suitable for a poem that is no longer than 20 lines. Rules: you must maintain one of the plot devices, and you can only use words that appear in the story. The purpose here is to show how dense and vibrant poems are, and how much they can convey with a few carefully chosen words. Can you recontruct the “essence” of a short story or essay in a poem? Thanks once again to all who submitted, and congratulations, Aaron! Happy Good Friday, and (early) Easter, to those who are celebrating this weekend. We’ll see you on the other side of Monday morning. 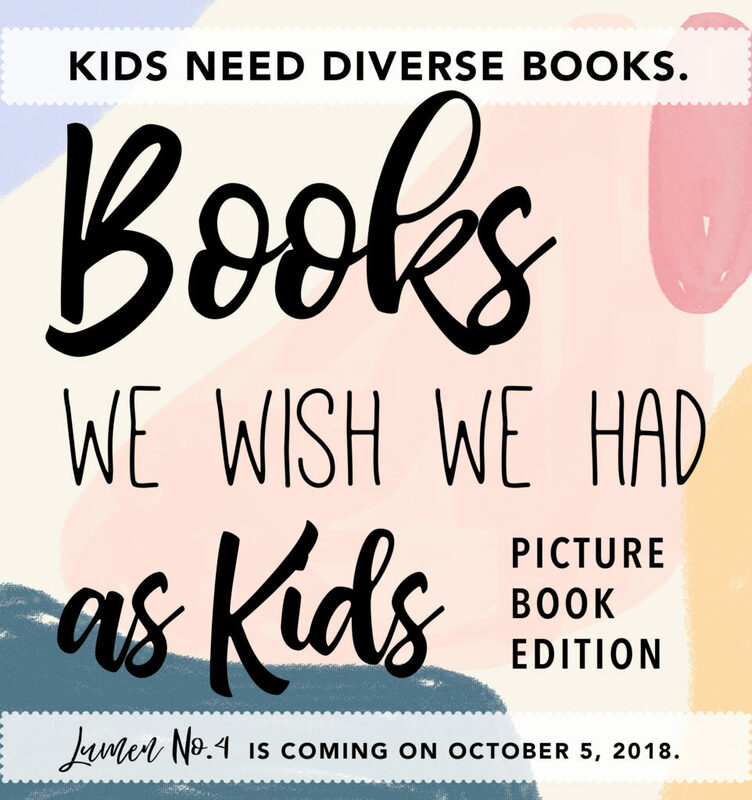 This week’s prompt features the idea submitted by LR reader Chris, whom we’ve chosen as the second runner-up in our National Poetry Month Prompt Contest (sponsored by Kaya Press). Chris’s prompt was short, but we felt that it aroused a number of interesting possibilities. It made me, in particular, think of the “beautiful witch” archetype that’s present in so many myths, legends, fairytales, and folklore (from the Greek sirens to Snow White’s stepmother) and which is often sinisterly underwritten by the deep-seated fears of people in power (men, whites, imperialists, US ‘nativists’, etc.) about those who are ‘under’ them (women, racial or political minorities, colonized and indigenous peoples, immigrants, etc.). In some cases, especially under colonial rule (and here I am thinking particularly of the line of questioning that Barbara Jane Reyes explores in her books Poeta en San Francisco and Diwata), culturally powerful local figures have been forcibly re-coded as demons, monsters, exiles by imperial powers. How the faces of those obscured behind such imposed masks of monstrosity might be reclaimed, even amidst the violence cast upon them by history, is something with which many writers of color, women writers of color, immigrants and descendents of immigrants, colonized peoples and descendents of colonized peoples, must wrestle on a daily basis. Chris’s prompt thus resonates with me in the sense that it asks us to explore the possibility of celebration, even from within (and, in fact, despite) a position in which individual identity has been marginalized by culturally- or socially-imposed images of monstrosity. Take something that (or someone who) is frightening and write a poem about why it (or he or she) is beautiful. Congratulations to Chris, and thank you once again to all who submitted! Stop by next week to see who we’ve chosen as our first runner up. Thank you to all those who submitted prompts to our National Poetry Month contest! We’ve chosen three runners-up and one winner, and will be announcing them week by week as we post the ideas that they submitted. This week, we’re featuring, as one of our runners-up, a prompt derived from an idea that was submitted by LR reader Janet. We were intrigued by Janet’s entry, an exercise which involved plugging elements of one’s memory of a childhood meal into the form of a recipe, and have elaborated upon and expanded that idea slightly to produce this week’s prompt. (The text of Janet’s original exercise can be found here). Write a poem that recalls the recipe for a meal from childhood or which uses such a recipe to frame your memory of that meal. Be sure to include, besides the actual ingredients that went into that recipe, descriptions of more intangible elements, such as the people, the place and emotions that were present when you ate that meal. Congratulations to Janet, and thanks again to everyone who entered our contest. Please check back again next Friday to see a prompt from our next runner-up! 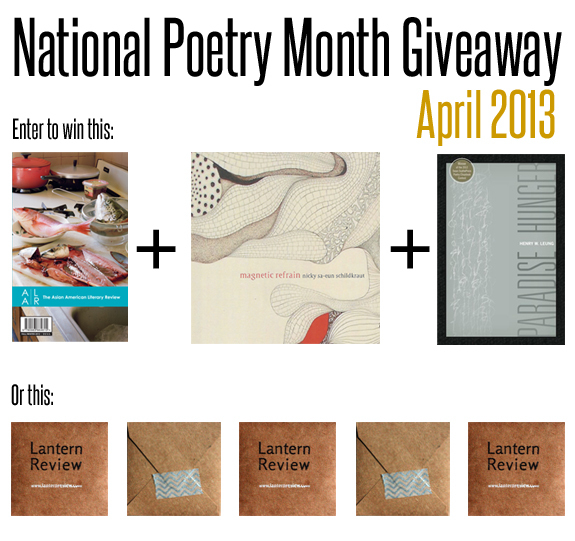 In anticipation of National Poetry Month this April, the LR Blog is once again going to be holding a prompt contest. This year, we are pleased to partner with the generous folks at Kaya Press, a unique small press that focuses on cutting-edge work by Asian diasporic writers. Just as with last year’s contest, the top four prompts that we select (three runners-up and one first-place winner) will be featured on the LR Blog on the Fridays of each full week in April, beginning on the 8th. The winners will be announced in reverse order, beginning with the third runner-up and ending with the first-place winner. This year’s grand prize (courtesy of Kaya’s sponsorship) is a copy of Lisa Chen‘s Mouth, which our staff blogger Henry will be reviewing later this spring. 1) Leave a comment on this post that includes the text of your prompt. Entries must be posted by 11:59PM EST on Thursday, March 31st. Comments on this post will close after that time. Please leave some form of basic contact information in your comment (preferably an email address), so that we can get in touch with you if you win. 2) During the first full week of April, we’ll be choosing the four prompts that we like best. The winner and all three runners up will have their entries featured as Weekly Prompts on the LR Blog during the four Fridays from April 8th – 29th. In addition, the winner will also receive a special grand prize that has been graciously offered by Kaya Press: a copy of Lisa Chen’s Mouth. We will announce the runners up and winner week by week, starting with the third runner-up and culminating with the winner, so keep on checking back in April to see if your entry has been featured. 3) A few ground rules: You may only enter once. Please submit only poetry prompts. Keep all prompts appropriate: anything of a bigoted, demeaning, or nasty nature will not be considered; we’d also appreciate it if you could please try to keep your prompts somewhat PG in nature, as when choosing prompts we always try to look for flexible exercises that can be adapted for use with either adults or kids. That’s it! We look forward to reading your entries. And while you’re at it, please do take a moment to check out Mouth or of the other titles on Kaya’s web site. Many thanks to Publisher Sunyoung Lee, Lisa Chen, and Kaya Press for their generosity. Congratulations to Kenji, the winner of our 2010 National Poetry Month Prompt Contest! Here’s a slightly paraphrased version of his winning prompt. Close your eyes and think about a time in your life that was extremely difficult. Imagine the scene in as much detail as possible. Now, holding that moment of difficulty in your mind, search the scene and find one aspect of the situation or your environment that was beautiful. It could be environment and sensory – a sound, color, texture, lighting – or it could be an insight, perspective or emotion that existed at the same time as the difficulty. Write about that beautiful aspect of this scene of difficulty for 15 minutes. We liked the creative possibilities of the paradoxical tension that this prompt asks the writer to explore: not beauty in spite of difficulty, nor a romanticized celebration of difficulty, but the strangeness by which a moment of difficulty can take on aspects of the beautiful. Exploring this sort of tension in a poem may have the potential to open up an image or brief narrative moment to strange, surprising, and ever more complex associations. Kenji will be receiving a signed copy of Monica Youn’s Ignatz. Congratulations to him, and many thanks to all who participated! Prompt: Find a childhood toy and write about the first memory that comes to mind. Also consider the toy’s colors, textures, heft, etc. We thought this was an interesting take on the exercise of writing about an object as a memorial trigger (I’ve done this before with vegetables and with household items like hangers and lightbulbs, but never with toys, which have a peculiar relationship to memory as both mute witness to and the subject/object of memory). There are so many ways that you could spin it: a textural list poem, a persona poem, an ode, a poem in the form of an advertisement, an epistolary poem, etc. Many congratulations to Steph! Please check back next Friday when we reveal our first place winner and the recipient of a signed copy of Ignatz.